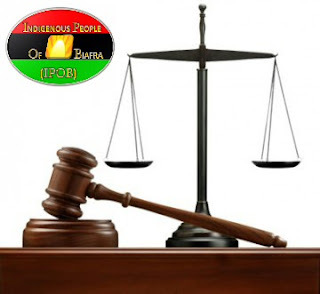 On September 20, 2017, Justice Abdu Kafarati of the Federal High Court, Abuja issued an Order purporting to proscribe the Indigenous People of Biafra (IPOB) on a companion ruling or designation that IPOB is a 'terrorist organization'. The Order was issued pursuant to an ex parte application brought by the Attorney-General of the Federation. "(1). Where two or more persons associate for the purpose of or where an organization engages in— (a) Participating or collaborating in an act of terrorism; (b) promoting, encouraging or exhorting others to commit an act of terrorism; or (c) setting up or pursuing acts of terrorism, the judge in Chambers may on an application made by the Attorney General, National Security Adviser or Inspector General of Police on the approval of the President; declare any entity to be a proscribed organization and the notice should be published in official gazette". As can be gleaned from above, it is the part of the provision stating that the application to declare an entity a proscribed organization can be decided by a judge in Chambers that formed the basis upon which the entire proceeding was instituted and decided without notice to IPOB. This rather unfamiliar process has troubled decent folks who have become all too accustomed to the famed fundamental right to "fair hearing" guaranteed to everybody by Section 36 of the Constitution. Presumably, this patently unconstitutional provision passed legislative muster for three reasons: (a) - the law was passed in 2011 which was when the Boko Haram terrorist attacks reached intolerable heights. So, the National Assembly (and the nation) might have felt that collective security is more fundamental than the individual right to fair hearing; (b) - the provision was specifically targeted at Boko Haram or entities that share similar terrorist characteristics, such as ISIS; and (c) - the provision borrowed from an identical provision contained in the famed American terrorism legislation known as 'Antiterrorism and Effective Death Penalty Act' (AEDPA) enacted by the US Congress in the wake and sheer magnitude of the September 2001 al-Qaeda terrorist attacks in the US. But as contrasted with the Nigerian genre, the analogous American legislation contained four key provisions or limitations that comport with basic constitutional tenets. They are: (a) - AEDPA was directed against Foreign Terrorist Organizations (or FTOs); (b) - the US Secretary of State (not a Judge) is the one that possessed the authority to make such designation and proscription; (c) - the designation/proscription can be reviewed/reversed by a named federal court - the United States District Court for the District of Columbia; and (d) - as implemented, the American counterpart to the Nigerian provisions has never been targeted at domestic or American political groups that share identical characteristics like IPOB, such as the Republic of Texas or the Republic of California agitators, which are undoubtedly more vocal than IPOB. However, the Nigerian legislation has some unique safeguards - some arguable, some not. The arguable part is contained in the phrase: "the judge in Chambers may on an application made by ...". This connotes that the application 'may be heard and granted ex parte'. So, it's arguable that the word "may" does not absolutely require the Judge to hear and grant the application without notice; and even when heard and granted ex parte, it should not - in accordance with pertinent rules of procedure - be a final Order. So, the legislature knew better to leave the Judge some room for discretion. Conversely, the non-arguable safeguards on fair hearing and other constitutional protections are contained in the following provisions of the Act, which states at Section 2(3)(ii) that 'for the avoidance of doubts ... nobody should be treated as such (i.e as a terrorist) because of his or her political belief'. To be sure, this phrase is to be understood as a 'saving' clause for Sections 35 (freedom of thought), 39 (freedom to hold opinion) and 40 (freedom of association) of the Constitution. Thus, it can reasonably be inferred that this very provision is geared to protecting organizations such as IPOB that may expectedly manifest a political opinion likely to be considered dissident or inconvenient by the government of the day. So, whereas an overzealous AGF might succumb to exaggeration in his application to the court, the Judge - whether in Chambers or not - is supposed to ensure that the application is not caught by the protections enacted at Section 2(3)(ii). Further, Section 2(5) of the same Act provides that "the Attorney General upon the approval of the President may withdraw the order if satisfied that such proscribed organization has ceased to engage in an act of terrorism - (a) the proscribed organization or person affected by the order made an application on notice". The most important point to be gleaned from this subsection is that 'the proscribed organization or person affected by the order can make an application on notice'. Now, it has to be understood - in context and practice - that application on notice is made to High Courts, not the Attorney General (that has no judicial powers), even as it is acknowledged that the wordings of this subsection appear nonspecific as to whom the said application should be made. Suffice it to say that it is clear enough that an affected organization (such as IPOB) or an affected person (such as any member of IPOB) is legally free to make an application on notice to the Federal High Court to reverse or vacate the order. Alternatively, the order can be tested in a new action, not under the TPA, but one that will go beyond to frontally challenge the constitutionality of the TPA itself. Such a step will present it as a matter of first impression because, apart from that of Boko Haram, IPOB is the very next case where the Federal government is on record to have taken a judicial step at proscription. But in the case of Boko Haram, there was no post-declaration judicial challenge (no appeal, no originating actions). It is reasonably presumable that Boko Haram played dead for two reasons: (a) - before then, the United States had already declared Boko Haram a terrorist organization and Boko Haram itself admitted that it was; and (b) - the group itself had owned-up to a series of open and notorious terrorist acts affecting both Nigerians and the international community. So, for an IPOB that is not burdened by the same characteristics that damned Boko Haram, an originating action can be brought - without qualms - to particularly challenge the constitutionality of the vexatious Section 2(1)(c) of TPA, especially as it clashes directly with Chapter IV (fundamental rights) of the Constitution. Better yet, further grounds can be harvested from that popular prior ruling by the same federal high court - per Justice Binta Nyako - that IPOB is neither a terrorist organization, nor did its members, including Nnamdi Kanu, commit any terrorist act. I must add that, assuming he was judicially aware of it, this very ruling should have persuaded Justice Kafarati to the point of either declining the AGF's application, or docketing it as an application on notice. (a) The designation/proscription affects many of the fundamental rights guaranteed under Chapter IV of the Constitution, of which their infringement can trigger appeal 'as of right'. (b) TPA did not - in its express provisions - preclude the right to appeal the designation/proscription. This is very glaring and thus should be understood for what it is - that right of appeal lies without limitation. (c) The appeal can be filed with a companion application for stay of execution, pending the disposition of the appeal. This very application is critical for two reasons - (i) it could be granted - in which case IPOB will have a temporary reprieve. (ii) if it's not granted, it theoretically triggers the right of interlocutory appeal to the Supreme Court, which gets to have a more considered judicious overview that might work to toll the proscription. (d) Grounds of appeal should centre on Section 1(2) of TPA which clearly defined what constitutes 'acts of terrorism'. The entire case may even turn on the provisions of this section, which can be contrasted to demonstrate that IPOB's activities - regardless of rhetoric and puffery - are far from being acts of terrorism as defined under this section. Finally, whether it is an originating action or an appeal, a lot of hay can be made that IPOB is registered and operates in the open - in more than two dozen countries. This, plus the universal definitions of terrorism (or terrorism as we know it) should ultimately count for IPOB in the final reckoning of this matter.